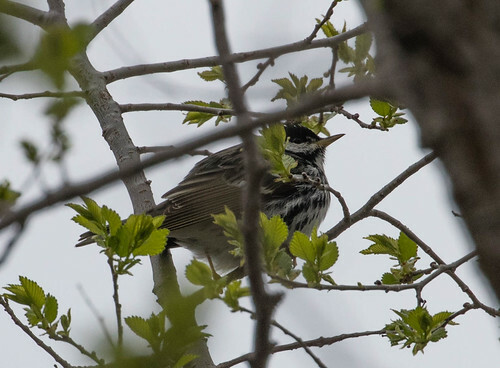 We had a total of 15 Duluth Audubon Spring Warbler Walks this spring; it would have been 17 but two were rained out. 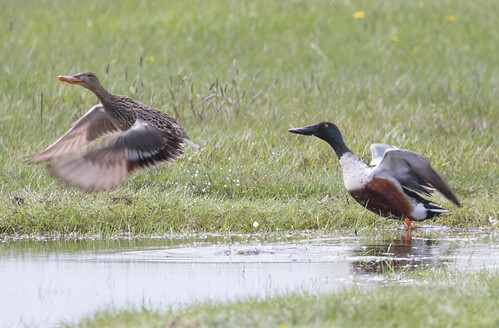 If people went on every Park Point walk, plus the little extension after two Park Point walks when several of us stopped at another stop on the Bay, they’d have ended with 111 species. 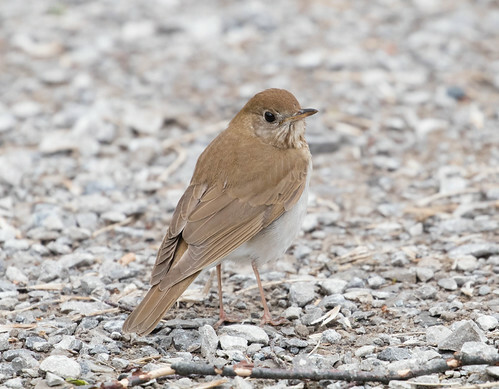 The Western Waterfront Trail walks didn’t give us quite so many species—96 in total—but 25 of them weren’t seen on Park Point. 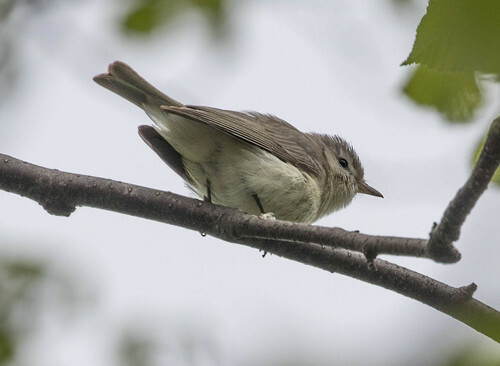 If you went on all 15 walks, you’d have ended the season with 136 species, including 21 species of warblers. Long underwear were almost imperative on a few of the earlier walks; even on May 30, I needed a warm jacket, gloves, and a scarf to be comfortable. This summer I might lead a few informal walks now and then on my own: I’ll post any announcements on the top of the sidebar on my blog. I was expecting today's temperatures to reach the 60s by the end of our walk, and our species count up in the 60s, too. As I write this on Thursday afternoon, the sun is shining and it's shirtsleeve weather out there, but not so this morning! It was 46 degrees when we were all done (even colder when we started! 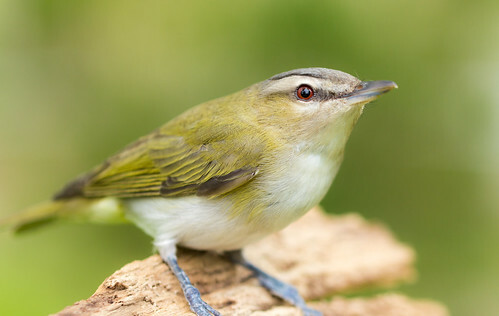 ), and we finished up our Park Point spring warbler walks with barely more species than the temperature—47 species. There were probably a few more warblers among the ones high in the pine trees, but they seemed as cold and yearning for spring as those of us watching them. One Blackburnian Warbler hunkered down near the top—our sharp-eyed participants found it and helped me find it. One courteous Pine Warbler sang a few times and gave us quick but clear looks. 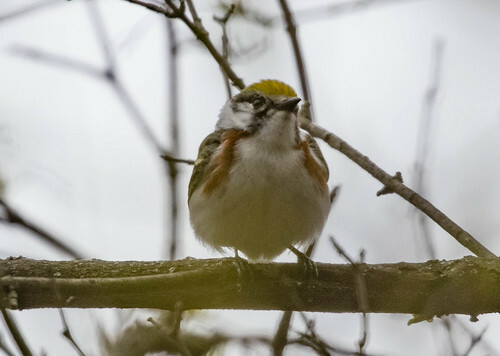 We had quite a few Chestnut-sided Warblers and American Redstarts, and Magnolias here and there. We had a quick look at a bedraggled fox lurking in the dunes and then walking far away down the beach—it's tough to be a predator. 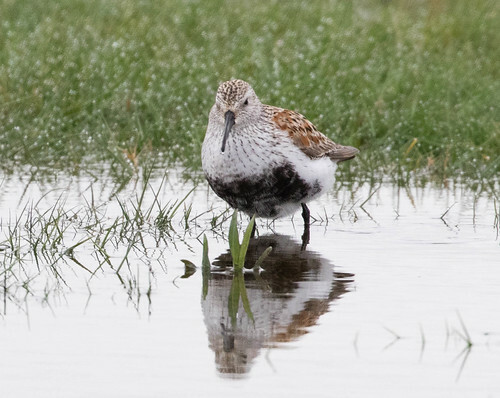 There were absolutely no shorebirds on the ball fields, despite a couple of hundred Ring-billed Gulls and one Herring Gull. The only shorebirds we had at all were when we took one of the boardwalks through the dunes, following a couple of birders on their own. 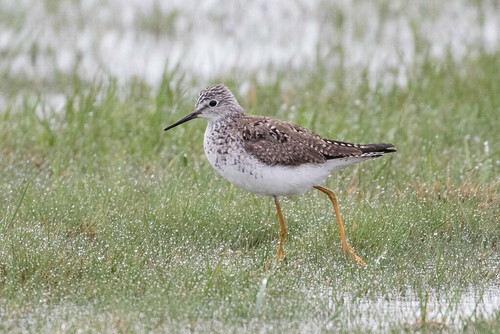 They showed us a nearby Spotted Sandpiper and also let people see through their scope two Red Knots (probably the same two that some birders saw earlier this week) way way down the beach. They took off and flew by. 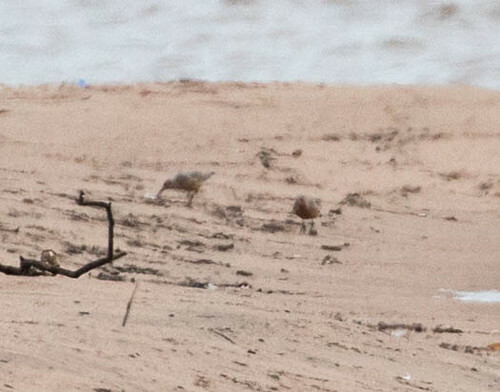 In the poor light, my photos are even worse than the picture of the Blackburnian Warbler, but regardless, these are the best photos I've ever taken of Red Knots in spring (which tells you how often I see them). 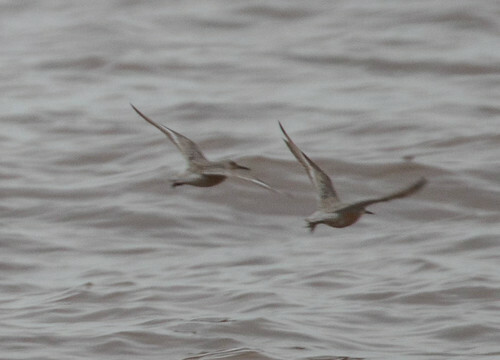 They were a lifer for Pip! 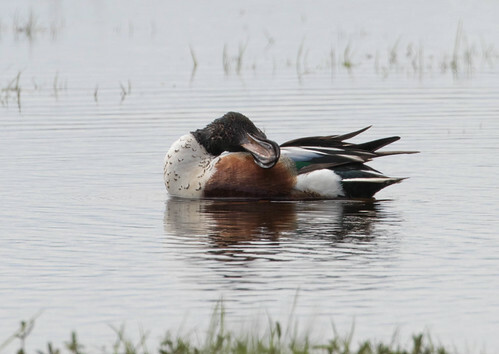 We had to work for just about all the birds today, and several were seen or heard by just one or two people. But everyone got to enjoy the little family of geese (normal broods have 5 or 6 goslings), and a "creche" of 31 goslings following an adult. We also had three nice-sized flocks of migrating Blue Jays. 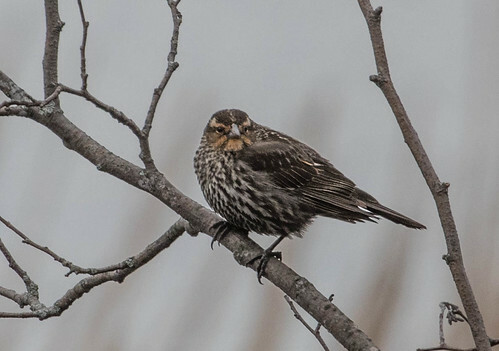 The cold, dreary day, even with lovely (if sparse) bird life, left us ready to get on with the rest of our day. But it was hard saying goodbye, too—these weekly walks have been really fun. 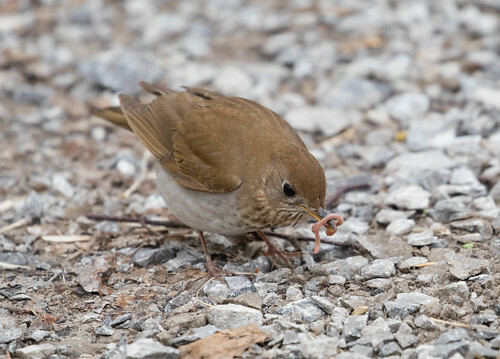 We still have one more warbler walk at the Western Waterfront Trail on Tuesday, but then we'll have another 10 months before next April. It's weird to be finishing up the walks at Park Point when many migrants haven't even arrived yet. 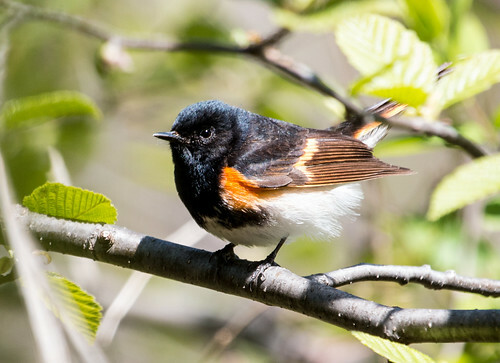 I woke up this morning to the sound of my backyard robin, House Wren, Song Sparrows, and Baltimore Orioles singing away. 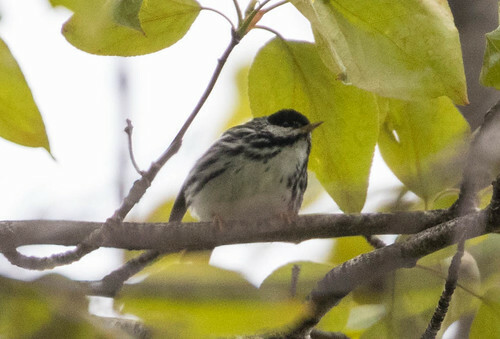 My yard was hopping with warblers last night, and first bird I heard when I took Pip out this morning was a Blackburnian Warbler—and I could hear the high notes at the end of each song thanks to my hearing aids. Pip had to get groomed, and while she was there, I went to the Western Waterfront Trail. 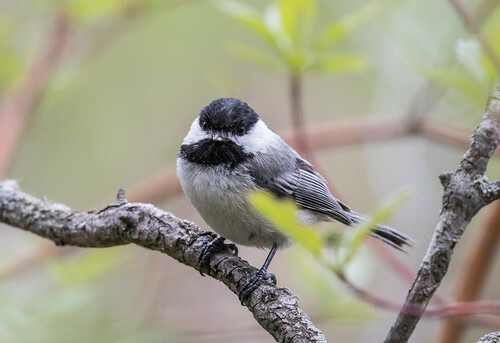 As I walked along the path at the beginning, a woman walking her dog said I looked like a birder, and asked if I knew what birds she’d been seeing—they were quite tiny, like chickadees, but colored sort of like Red-winged Blackbirds. I showed her the pictures of American Redstarts on my cell phone’s Sibley app. 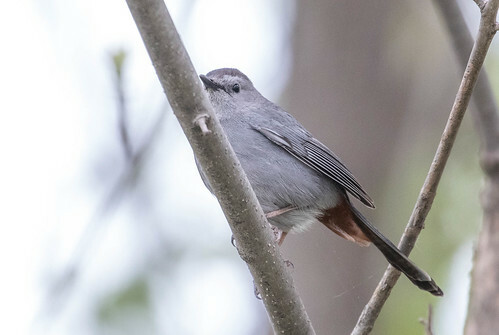 She was happy to have her question answered, and I was happy to be living in the kind of world where people notice little black-and-orange birds, want to know what they are, and feel comfortable asking someone with binoculars. 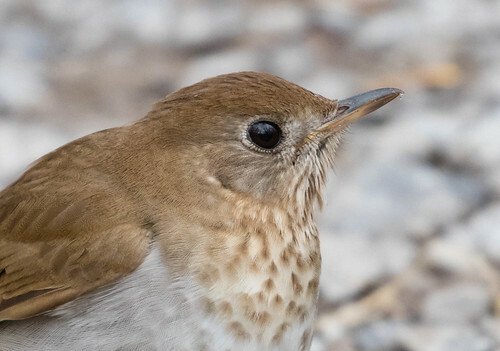 I’d led a warbler walk here yesterday, and there were only a few new birds today—a couple of Swainson’s Thrushes and a Gray-cheeked Thrush. 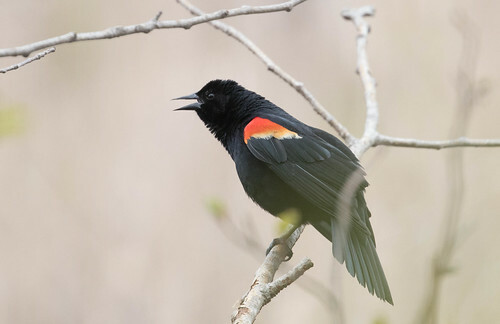 Orioles were noisier than yesterday, but Red-winged Blackbirds were quieter. I saw several Veeries—we seem to be at peak migration for them. And I also came upon a very welcome sight—a family of Canada Geese. I’m a sucker for baby ducks and geese, and these guys were still pretty tiny. I took a lot of photos since the parents didn’t seem too worried about me. Pip’s grooming takes about an hour, so I didn’t stay too long. 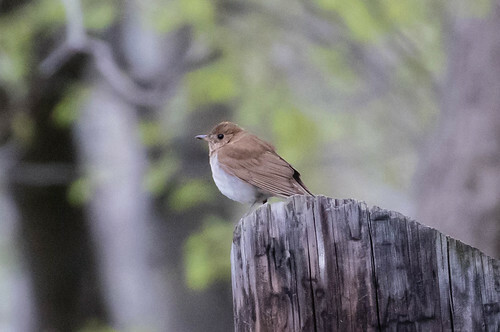 On my way back, I came upon the coolest sight of the morning—a Veery on the trail right in front of me. 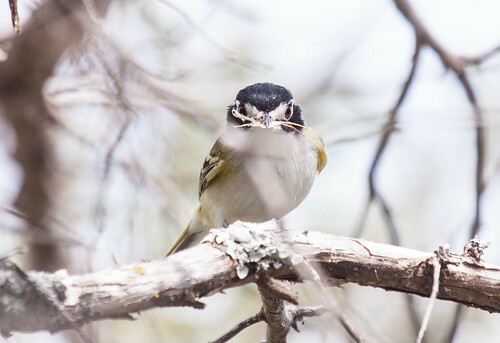 I pretty much stayed rooted where I stood, clicking away photo after photo, and the bird didn’t seem concerned at all—he or she actually came closer rather than moving further away. 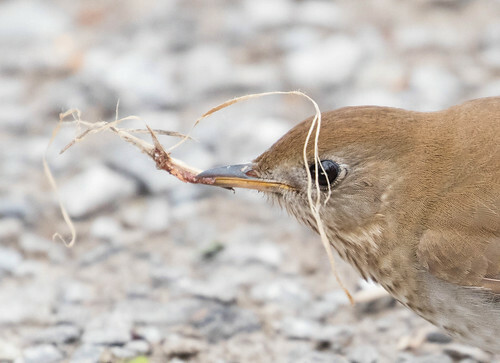 My photos show every feather, and I even got some of the little thing extracting a worm from some kind of dried reed and gobbling it down. I wasn’t in a hurry, so I waited for him or her to move on before I did. It felt so warm and lovely to spend a few minutes with this normally secretive little sprite. 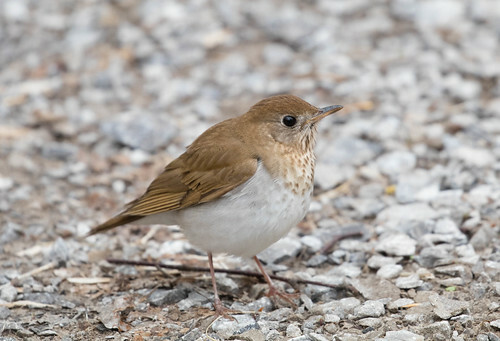 A man was coming from the parking area as I was leaving, right as another Veery flew across the trail in front of him, so I made a friendly comment about the weather and the good birds. He pulled a pair of binoculars out of his pocket, so I naturally gave him a couple of tips about where the warblers were. Suddenly he asked, “Are you Laura? !” And that felt pretty lovely and friendly, too. Pip was thrilled to see me again. It’s such a weirdly gratifying thing to have a little dog, and be the sun and the moon and the stars to her. On our way home, we stopped at Park Point, where a few school buses in the parking lot and throngs of children in the picnic area and playground gave intimations that the school year is just about over. About 300 Ring-billed Gulls were loafing in the ball field. 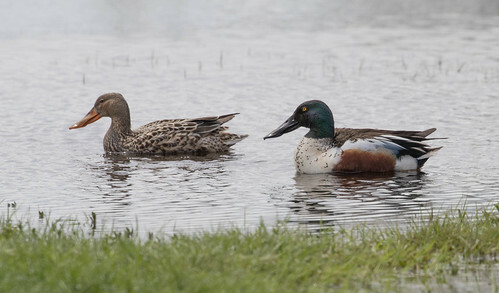 I couldn’t pick out any outliers among them—just one Greater Yellowlegs—but in one fairly small puddle right next to the parking lot, a pair of Northern Shovelers let me take lots of photos. It’s been very discouraging lately keeping up with the news—the efforts to privatize more and more federal lands that were set aside for all of us and for wildlife; the reversal of the ban on lead ammo in national wildlife refuges; the serious efforts to dismantle the Endangered Species Act and cut back funding for the agencies that protect not just wildlife but the air we breathe and the water we drink. Sometimes I wonder if it’s worth fighting anymore—we seem to be returning to the days before that first Earth Day, as if all the things I’ve fought for my entire adult life have been for naught. A morning like today does two things—reminds me of the beauty and value of the things I’m fighting for, and restores my spirit. 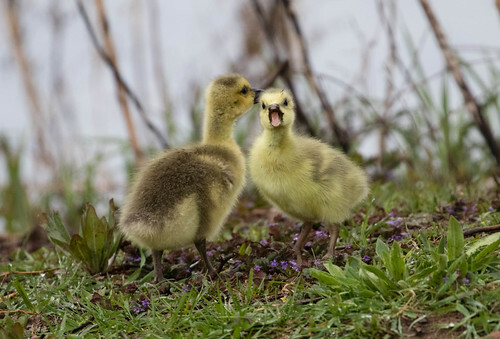 I was filled with gratitude for baby geese, a friendly Veery, beautiful Northern Shovelers, a good little dog, and people who care about these things, too. This is the world I choose to live in. 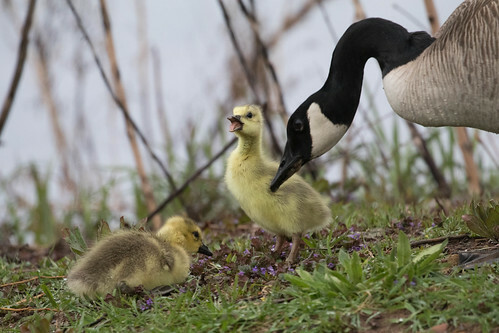 We began our Duluth Audubon Society spring warbler walks the first week of April this year, and ever since the very first walks on the Western Waterfront Trail and Park Point we’ve been watching Canada Goose pairs. 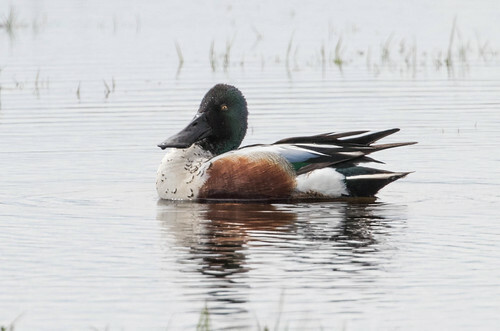 First they were romancing, and then we started seeing females on nests, the male always nearby; when a female took a bit of a break to feed and stretch, the male was always right there with her. 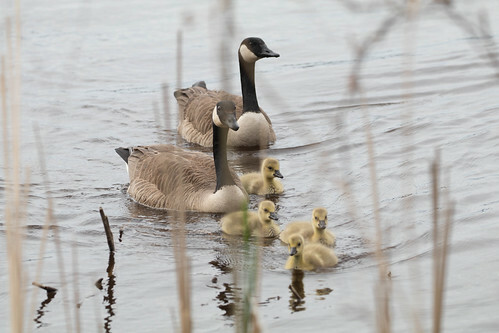 Geese are inspiring in how each pair works as a perfect team to raise their young. By May I was growing more and more impatient to see baby geese. 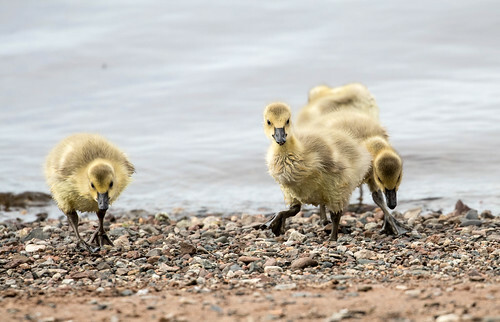 I know we have way too many Canada Geese, but their babies are extremely adorable, and I love photographing them. Some people on our warbler walks saw their first last week on Park Point, but I didn’t see any until yesterday. It was very cold, and one mother was hunkered down in the grass with babies sitting on her back, covered a bit by her feathers and wings. 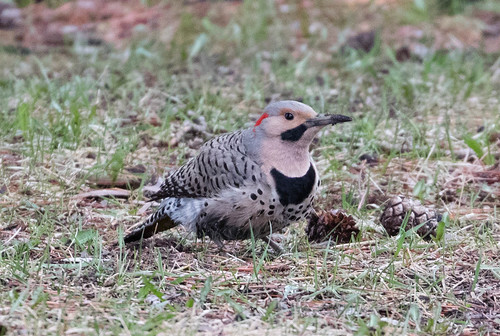 The mate got restless as I slowed down, so as much as I wanted a photo, I didn’t pull over—it seemed rude and selfish to risk disturbing the birds when they looked so cozy. When I was driving the other way leaving the point, I saw two families by the edge of the water, but from that side of the road I would have had to get out of the car, risking disturbing the parents—again, it didn’t seem worth it. Then today, on the way to my Park Point warbler walk, the geese were close enough to the road for me to get several photos. 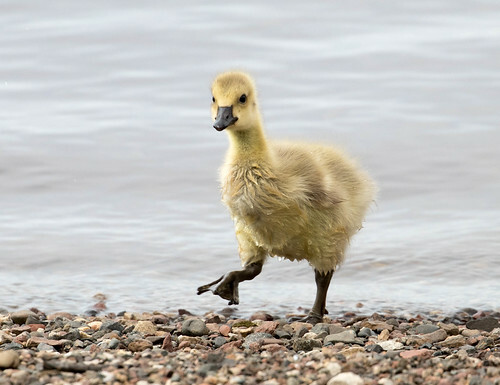 I was thrilled—no matter what they do, baby geese do it in an adorable way. 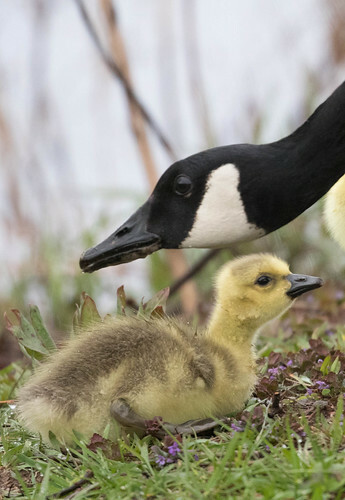 Baby geese are too innocent to understand danger even as they stay extremely close to their parents. The security the parents give them allows the baby geese to explore in as safe a way as possible this amazing world. Just imagine—less than a week ago, each one of these little birds was scrunched up inside a dark egg, warm and safe but hardly able to move. Did they have any inkling what the big wide world would be like? It was hard to break away from them, but I had to get to my warbler walk. 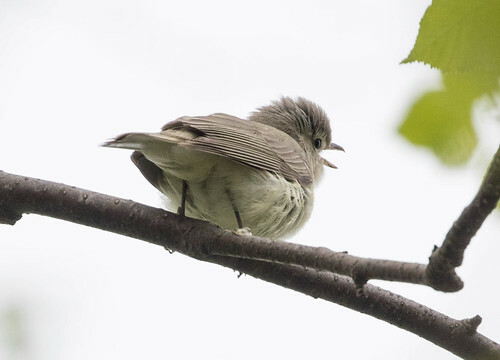 We had so many birds, including 17 different kinds of warblers, that I pretty much stopped thinking about adorable baby geese. But as I started out of the parking lot, I was suddenly filled with anticipation, looking forward to getting more shots of the adorable little guys. 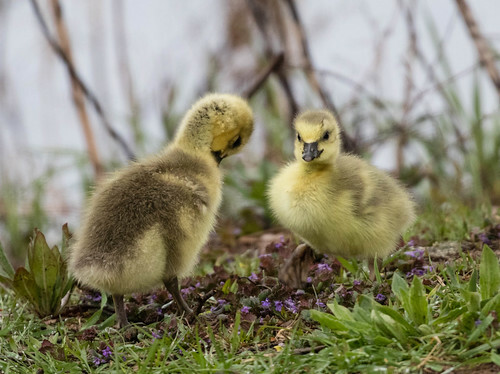 As I approached the area where I’d first seen the geese, I saw the adults in the middle of the road, with the goslings milling close to them. The parents were looking down, and I didn’t want to risk startling them, so I pulled over well before I got to them. But even from that distance, the parents started walking off the road, their babies sticking close. Well, all but two babies. 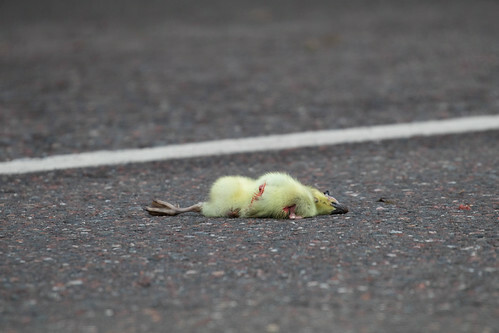 Apparently the parents had led the young birds across a bit earlier, and someone ran them down—two babies were dead in the road. I think the parents must have returned to them, not ready to accept the finality of this horrible loss. The speed limit on Lake Avenue all along Park Point is 30 miles per hour. With all the vulnerable wildlife on what is one of the most important stretches of any migration pathway on the continent, I’d prefer the speed limit to be no more than 25. But most of the cars that are out whenever I happen to be there are going faster than I am. I can’t imagine how anyone could have approached a goose family—the babies stick close to their parents—without noticing them on the road. 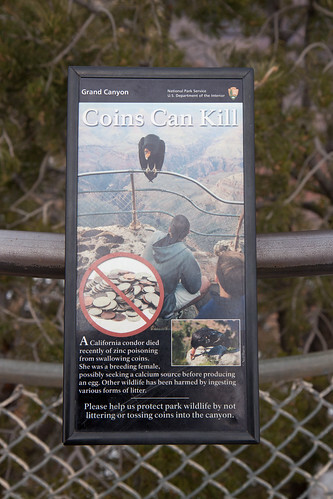 But I also can’t imagine anyone killing baby geese intentionally. I took my first ornithology class at the Kellogg Biological Station, about 65 miles from our apartment in East Lansing, Michigan, in 1975. On one of our drives on a very foggy morning, birds were everywhere. Russ drove very slow so he wouldn’t kill any of them. The distress of hitting a bird would have been worse for us—to say nothing of for the bird—than missing 15 minutes of even the greatest class. Memories of that foggy morning and of several incidents in Duluth when people hit lots of grounded warblers or owls near roadsides inspired me to include in my book 101 Ways to Help Birds Number 60: “Drive at the slowest speed that is safe, courteous, and convenient.” Driving too slow in traffic is not safe or courteous, and if you’re late for an engagement, it’s not convenient. But slowing down saves energy, human lives, and wildlife. I explained this and gave statistics about the magnitude of the problem in the book. All the text for this "way" is available for free online. 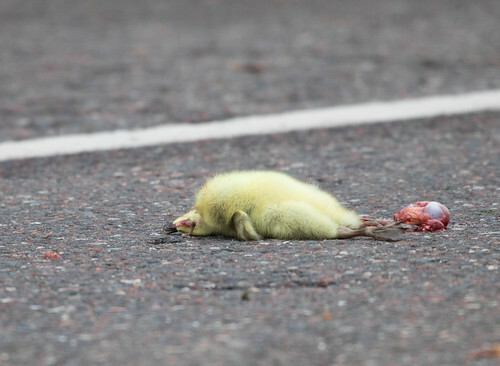 But today when I came upon those tragic little baby geese, hardly out in the big world at all before someone driving too fast mowed them down, I wasn’t thinking in terms of the polite words in my book. Dammit, people—slow down!